Successfully Added Ionic Hair Straightener And Brush - Digital Temperature Display, Nano Coating, 5 Temperature Settings (Black) to your Shopping Cart. Leave all your bad hair days behind for good with the 2-in-1 hair brush and straightener. It’s quick, it’s easy and it will get you ready for a night out in no time! No longer you will have to worry about rushing to the hair salon right before a party or worry about what rain or wind will do to your hair. 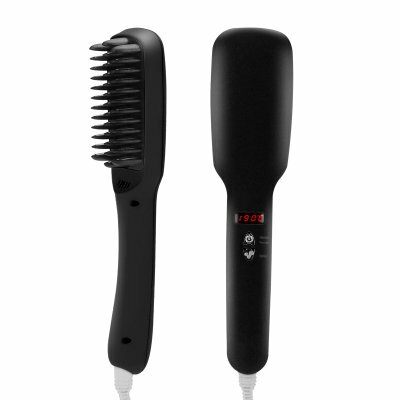 With the 2-in-1 hair straightener and brush, all your hair troubles are behind you. What’s an ionic hairbrush you might ask - and we are glad you did. You see, when you brush your hair with a comb or towel-dry your hair, it strips your hair of negative ions. With only positive ions in the hair, it becomes frizzy, hard-to-brush and static. That’s where an ionic brush comes in. It restores the balance of positive and negative ions in your hair, making it smooth and manageable. The heated ionic plates are great for a quick hairdo and exploring more style options. You don’t have to drop the big bucks on hair salon visits - with this hair straightener you will be able to get your hair looking great all by yourself and its so quick to use.